Essay is a short piece of writing at least three paragraphs long that is taught in the fifth semester in English Education Program at Adibuana University of Surabaya. However, mostof students don’t pay attention to the structure of essay and also the sentence structure used to build up their essays. That’s why the researcher investigates how is the structure of an essay made by the students of English Education Program 2013 at Adi Buana University of Surabaya. The theory used by the researcher to analyze the data is stated by zemach. In this study, the researcher uses descriptive qualitative in doing the research. 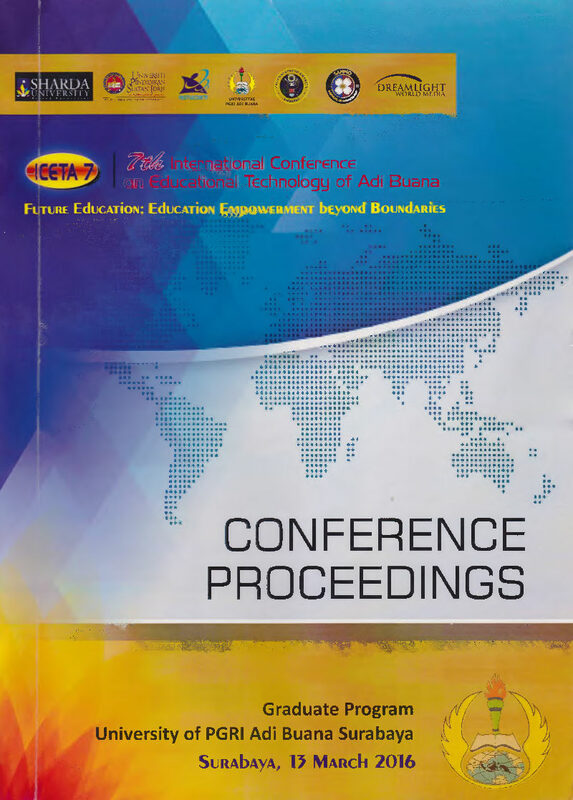 The data of this study is all the words, phrases, and sentences written by the students of English Education Program 2013 at Adibuana University of Surabaya related to the research questions. The source of Data is the essay writing made by them. The data collection technique is done by the researcher through getting the scores of students’ writing, finding the students’ writing, and copying the students’ writing while the data analysis is done through collecting the data, classifying the data, reducing the data, selecting the data, and displaying the data. Result shows that students organizaiton of essay is complete, there are introductory, main body, and also concluding paragrapah. However, the components to build up a good paragraph such as thesis statement, topic sentence, and supporting sentences are not always paid attention by them. Those happen because they lack of ideas and grammatical compentency. The conclusion is It is needed to make the outline of essay which is able to be used as the guiedance how to build up from paragraph to essay, so the ideas could be organized well. Writing is one of the language skills which is used to transfer the ideas. Then, they are arranged together in a clear logical way, so the paragraph can be created. That’s why, a group of related sentences are needed to make a paragraph. Additionally, a short piece of writing at least three paragraphs long is called by essay. The essay is a piece of writing that consists of several paragraphs related a single topic. The term “essay” comes from the French word, which means to try or trying. The essay is an attempt to communicate the information, opinions or feelings and usually presents an argument about a topic. In this case, the essay is a short article which usually contains the author’s opinion on a particular subject. In creating an essay, the author must pay attention to the structure of essay in order to make the readers easy to understand what the author means in his or her writing. The structure of essay consists of three elements. They are introductory paragraph, body, and concluding paragraph. Introduction is an important part of an essay. This section determines whether the reader will be interested to finish reading the essay. Introduction paragraph obviously increases the interest of the reader to finish reading. In contrast, preliminary boring will make the reader end his reading. Basically, the introduction contains an adequate introduction of the topic to be written. The idea that is written in the introductory paragraphs provides an overview of the ideas or arguments to be written on the content of the essay. The most important element in the introductory paragraph is a sentence thesis (thesis statement). Thesis sentence is the main idea of ​​the essay. This thesis sentence serves as a controller of an idea that would be submitted in the body of the essay. In essay body, the author is able to develop the ideas based on the thesis statement stated at the end of introductory paragraph. In addition, the author can transfer his or her ideas more than one paragraph. So, the author can express the ideas related to the thesis statement. In the body of essay, the reader will know what the author means. However, some of authors do not pay attention to the development of ideas in the body. There are some sentences which have no relations to the thesis statement. The body of essay consists of many ideas which are able to make the reader confused. This phenomenon is able to reflect that the author loses the focus on his or her writing. The last element is concluding paragraph. In this section, the author can give the command or summary to the whole content of the essay. But, some authors often make the concluding paragraph by using a sentence. It should be more than one sentence because the paragraph is a group of related sentences. Moreover, the author is also able to give the judgment or opinion to the phenomenon happens in an essay which the author writes. 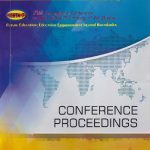 Based on the background above, the researcher wants to investigate the essay written by students of English Education Program 2013 in Adi Buana University of Surabaya. They get writing II in the fourth semester. In this lecture, the students are hoped to be able to develop the paragraph to an essay. That’s why the researcher thinks that the study of essay written by the students of English Education Program 2013 are able to give the description how well they develop their writing into an essay. In conducting the study, the writer prefers to use a descriptive qualitative research as a research method. It Concerns with descriptions, qualities and observations (Swetnam, 2004: 128). The aim of the descriptive method itself is to obtain systematical description and accurate facts. According to Flick et.al (2000:3) qualitative research is a research procedure that draws attention to the process, meaning patterns, and structural features. Thus the data in this research are described in the form of words, phrases, sentences, or paragraph relating to the text which the writer investigates in order to answer the research questions stated in the previous chapter. They are the structue of essay and the students’ writing styles. So, from the explanation above, descriptive qualitative method is an appropriate one to conduct this research. The data of this study is all the words, phrases, and sentences in Essay written by the students of English Education Program 2013 at Adibuana University of Surabaya related to the research questions. The source of Data is the essay writing made by them. In this section, the researcher acts as the main instruments to collect the data by using a purposive sampling. As stated in Swetnam (2004: 128) purposive sampling is non-random samples of those believe to be representative. The researcher took some essays which got A good mark from the lecturer and also had at least three paragraphs long. In this step, the researcher got the students’ scores by asking the asisstant lecturer of Writing II at English Education Program at Adibuana University of Surabaya. Then, the researcher classified the students’ score based on their final score. Next, he chose the name of the students from English Education Program who got A score of writing II after completing the lecture. Then, the researcher listed their names and registration numbers in order to find their writing. In this step, the researcher chose the class in Adibuana University of Surabaya. It was easy to find the writing because the students must collect their assignment to the lecturer every week to know the students’ ability progress in writing. Then, the researcher searched the students’ names that got A score in their lecture of writing II. After getting the essay writing, the researcher scans the essay writing to make them in soft files to be put in the appendices, while the hard files are used to be analyzed and described by the researcher based on the structure of essay and also the sentence structure which are used by the students in writing an essay. In this step, the writer describes the analysis of the data. There are some ways that the researcher has done to analyze the data. They are collecting the data, classifying the data, reducing the data, selecting the data, and displaying the data. In this step, the writer collected the essay written by students who got A score in writing II. The researcher got many data that consist of words, phrases, and sentences. After collecting many data, the next step that the researcher has done is classifying the data. Many data that consist of words, phrases, and sentences are classified according to the topics and analyzes the data accurately. By classifying the data, the writer gets the frame works how to answer each research questions which are stated in the previous chapter. After classifying the data, the researcher reduces the data in order to simplify the data, so the researcher is able to determine which data are relevant to the research questions, and which data are not. In order words, reducing the data is used in short of analysis in which sharpens, classifies, reduces and organizes the data in such a way to draw the conclusion. After reducing the data, the researcher selects the data based on the topic related to the research questions. Then, he organizes the data with the title that becomes the answers of research questions. After the collecting, classifying, reducing, and selecting the data, final step is displaying the data into word, phrase, and sentences related to the research questions in order to make the conclusion of the research. The researcher puts all displaying data in the chapter of findings and discussion. In this part the essay organization are analyzed based on the theory stated by Zeemach (2005) and also Doigu (2002) to discuss the following phenomenon The phenomenon found in the first data is that the essay written by the student is complete involving the introductory paragraph, body, and also concluding paragraph, however, the writer didn’t pay attention well to the repetition of the ideas, structure of sentences, and also the number of sentences in each paragraph. Although the students could express the ideas well, they have to pay attention to the definition of paragraph consisting a group of related sentences. In the second data, the students wrote the essay as follows; Based on the second data, the researcher finds new phenomenon which is different with the first data. The essay organization is complete. It has introductory paragraph, main body, and concluding paragrapah, but the student could not develop the introductory and concluding paragraph well. It only has some sentences to reach the thesis statement or to give some comments or restate the ideas written in the previous paragraph. There are many sentences in introductory paragraph, main body, and concluding paragraph which are grammatically errors. Based on the the third data, the researcher finds that the essay organization written by the student is complete. There are introductory, main body, and concluding paragraph. There are some sentences which are errrors grammatically in each paragraph. There is no idea which is out of topic. The sentences in the introductory paragraph are able to give the brainstorming for the reader then the next sentences are able to bring the reader to the thesis statement that the student wanted to describe more in the main body of essay. In addition, the main body written by the student consists of topic sentence which is able to develop by using supporting sentences, but there are some points which have not been described by the student about the reason why Dr.Oz Indonesia is attractive and entertaining. On the other hand, the student was good enough to make the concluding paragraph. She/he gave some comments, restated the topic sentence, and also wrote some important points from the previous paragraphs. Based on the data above, the researcher finds some phenomenons that the essay organizations written by the student above is not complete. There is no concluding paragraph which restates or giving some comments to the whole essay to close the writing. The student could write the introductory paragraph well, but he/she wrote some sentences which were out of place. It means that some sentences are not appropriate to write in introductory paragraph. The main body of essay is able to support the thesis statement. There are three paragraphs in the main body of essay. If the students wrote the concluding paragraph, the essay would be the complete on its organization. The next data which was written by the student was Mario Teguh Golden Ways. The next data, the researcher finds that the role of thesis statement and topic sentence in each paragraph are very important. Student’s essay organization is complete, however, the ideas could not be organized well. There are alot of ideas which are out ot topic. So the introductory paragraph, main body, and also concluding paragraph didn’t have a good unity. Based on the data data above, the researcher finds some new phenomenons. The Essay organization written by the student above is complete. There is introductory parargraph, main body and also concluding paragraph. However, the student was not able to write the topic sentence in introductory and main body paragraph. So the ideas could be developed based on the topic sentence. Some sentences are difficult to develop because he/she could not find the topic sentence in each paragraph he/she writes. On the other hand, the concluding paragraph is good. He/she was able to restated or gave some comments to the topic of esssay and also wrote some important points. Additionally, the researcher finds some phenomenons that the organization of essay written by the student above is not complete. There is no concluding paragraphh. There are some information gaps in introductory paragraph. The sentences are not connected each others. Additionally, there are two paragraphs in the main body of essay that actually it should be combined into a single paragraph. The first and second sentence in the main body belong to the general statement which should be written in the introductory paragraph. On the other hand, the studen also wrote a single sentence in concluding paragraph. That is why the essay organization written by the student above is not complet. It only consists of introductory and main body paragraph. That’s all the phenomenons that the researcher finds to answer the first research questions. The conclusion that the researcher can draw is that the students need guidence to build up the organizaiton of essay. It is better to make the outline of essay which is able to be used as the guiedance how to build up from paragraph to essay. In addition, the essay organization made by the students are influenced by the ideas they have and also the grammatical competent. Ary, Donald and Lucy Cheser. Asghar Razavieh. 1990. Introduction to Research in Education. Oralando: Holt, Rinhart, and Winston, Inc.
Brown, H. Douglas. 2004. Language Assessment: Principles and Classroom Practices. New York: Pearson Education, Inc.
Byrd, Patricia., and Benson Beverly. 2001. Applied English Grammar. Boston: Heinle. Duigu, Gabi.2002. Essay Writing for English Tests. NSW:Academic English Press. McCrimmon, James M. 1967. Writing with a Purpose. Boston: Houghton Mifflin Company. Oshima, Alice and Ann Hogue. 1991. Writing Academic English 3rd Edition. London: Longman. Zemach, Dorothy and Lisa A Rumisek.2003. Academic Writing from Paragraph to Essay. Spain:Mc.Millan Publisher. Rikat Eka Prastyawan is an english lecturer in English Education Program at Adibuana University of Surabaya. His main interest is Teaching Language Skills and Components. The published articles which were ever written by him were about the Study of abstracts written by english education program at State university of Surbaya, Code Mixing and Code Swtiching used by English Education Teachers at SMAN 16 Surabaya, the implementation of integrated writing technique to teach writing, and Sentence structures to build up abstract.